We are the 54th Pennsylvania Infantry reenactors. We are a non-profit organization of living historians and volunteers. We are looking to raise money to be able to afford to replace our original 27 year old United States flag. While we can raise some of the funds ourselves the costs are far beyond our capabilities. As for why we need the new flag. Our flag has significant tears along the fly edge and staff edge and, while attempts were made to repair the rips, they are failing and it is only a matter of time before we can no longer save it. You also may be wondering, why a flag? Well, flags are instrumental in teaching the public about the Civil War while providing an accurate account of what a United States Army regiment would possess during the war. They also are a symbol, not only of ourselves in the reenacting world, but of the men who served and some of whom gave all during that war in defense of the Union. The cost is approx $1500 for a new United States Flag. While the price seem high, it is due to the fact that the flag is very large and made of silk as well as all details have to be hand painted onto the flag. Once we have our flag we plan on having a ceremony at the 54th PA Monument on the battlefield at New Market, VA. We would like to extend an invitation to anyone contributing who wishes to attend. Details will be available in the future upon request as most likely we would be looking at next year during the annual May re-enactment. This is due to the time it takes to make the flag. The flag would take about 6 to 8 months to make. Hopefully this gave you some insight into why we are looking to raise this money. 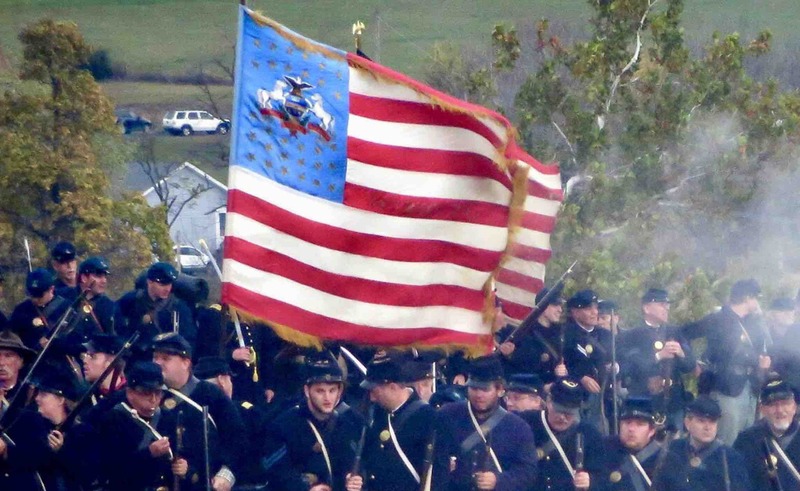 We volunteer our time and efforts to bring the Civil War alive for the public and we know any donation you can give will help us continue to do so for the for seeable future. Fell free to visit www.54thpvi.com to learn more about us. We appreciate your generosity immensely and hope you can visit us at an event. Thank you!